The Company has also incorporated its Foreign subsidiary in Singapore for "General Whole sale Trade (including General Imports & Exports)" in addition to a Domestic subsidiary to pursue the business of International Trade vigorously and profitably. Company has competent and motivated human resource, best in trade to look after the gambit professionally and profitably. 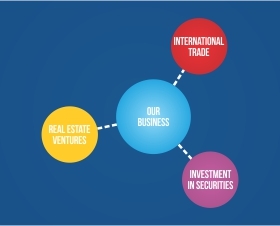 The company itself and through its associates and other promoter group companies has substantial investment in the real estate sector in the Commercial, residential, retail, hospitality segments, land and development thereof. The Company with its Strategic Partner “Sattva Group” (Salarpuria Group) has embarked upon an ambitious business plan to invest in the Real Estate Sector in the country to reap the rich dividends. Under the joint development with Salarpurias, KPL has embarked upon development of Mega residential projects in Bangalore and Pune. KPL & its Group Companies possess landmark commercial buildings in the business district of Bangalore, Mumbai and Pune leased out to top notch IT Sector Multinational Companies. Various joint development projects have been undertaken by the Group in the Hospitality Sector for development of Malls, Hotels and Service Apartments in Kolkata and Lavasa. A 350 keys hotel is running at Kolkata which is operated and managed by International Group – "Accor Hotels" under the brand " NOVOTEL", similarly hotel/ service apartment project in under various stages at Lavasa. KPL being profit making has invested its funds in stocks and Mutual Funds besides subscribing to the Share Capital of its subsidiaries.